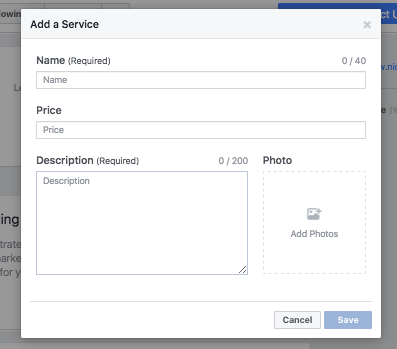 A while back we took you through how to build a Facebook shop, a great marketing tool for users looking to either extract more leads out of Facebook or to even use Facebook solely as their online eCommerce presence. While it's pretty handy for businesses selling a physical product it wasn't really applicable to a serviced base business or a business who provides a combination of products and services. 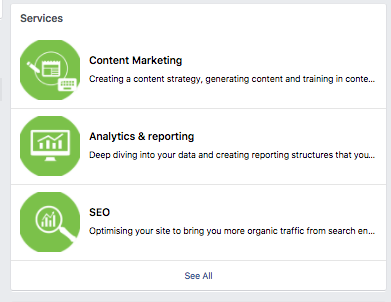 Thankfully, Facebook has considered the service based business and given you a services tab to showcase your offerings and this is what it looks like. So how do you get your services listed on my facebook? Is so simple and in a few steps, you're done. Click Services on the left side of your Page. Enter the info about your service, like its name, price/rate which is optional and a short description of 200 characters or less and finally a display image. To list another service, click Add a Service and repeat the process. When you're finished listing services, make sure the visible tab is on the right is turned on. 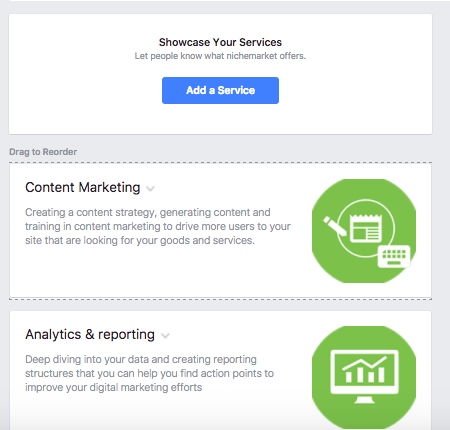 Once you're done visitors will be able to view your services either by the services tab or within your pages newsfeed. Bonus tip! To give your services listings a bit more prominence you can have it sit above the fold by rearranging your tabs, under edit page on the settings menu.